Learn more about the museum studies concentration and current exhibitions at the Handwerker Gallery. Love museums and learning about art? IC’s new concentration in museum studies may be for you. Launched last fall by the Department of Art History, the concentration will feature traditional classes and frequent field trips. 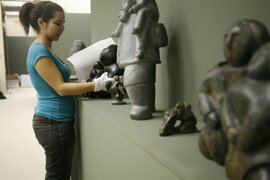 Courses will include hands-on work in Ithaca College’s Handwerker Gallery, visits to Cornell University’s Johnson Museum of Art, and field trips to other regional museums so that students can apply what they’ve learned in their classes in a museum setting. Paul Wilson, an assistant professor of art history says, “One of the motivations for the program is helping students think about what they can do with a degree in art history.” Museum and gallery administration, education, publishing, advertising, architecture, and historic preservation are just a few potential career paths for art history students.